When you make a purchase on Amazon using their new Amazon Smile website, a portion of your purchase will be donated to the charitable organization of your choice. Friends of Forgotten Children is one such charity. Just sign on to Amazon using smile.amazon.com, choose Friends of Forgotten Children as your charity of choice, and shop away or click here. Amazon will donate 0.5% of your eligible purchases to your charity. Thank you! 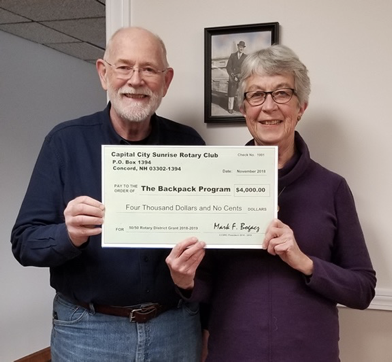 Profound gratitude from the Backpack Program at Friends of Forgotten Children goes to the following donors: Rotary International and Capitol Sunrise Rotary for their $4000 matching grant and to Franklin Savings Bank Fund for Community Advancement for their $2500 grant to bring 37 students in Boscawen into the program; and to Lincoln Financial Foundation for a $2000 grant. Thanks for individual support goes to a generous anonymous donor for providing the resources for the year for four children in Salisbury; to local residents for providing support for five students in Webster; to NE Accountability LLC and Capitol City Sunrise Rotary for donations of $500 or more; to the Hannaford Bags 4 My Cause Program for their support; to Hannaford, Concord, for their donation of bags for the year; to Wendy Follansbee, Elizabeth Hodgdon, the Greater Concord Interfaith Council, Dr. Soheila Degieux, Linda Karr, Fran Philippe, Sharon St. Onge, Sean and Stephanie Wheeler, Kathleen Beliveau, Edwina Czajkowski, Marylin & Dewitt Davis, Pauline Lacasse and Dorean Kimball for their donations. 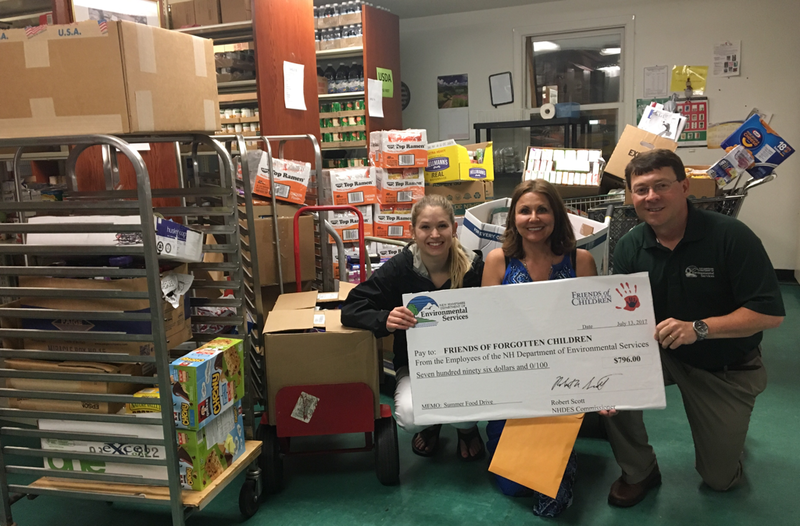 The Backpack Program at Friends of Forgotten Children is nearing the end of its second year of providing needed nutritious weekend food for children in the Merrimack Valley School District. The Program began in March of 2017 with 30 children in Penacook and thanks to these generous grants and donations, we have been able to expand our program to include more children in more schools in the Merrimack Valley School District. 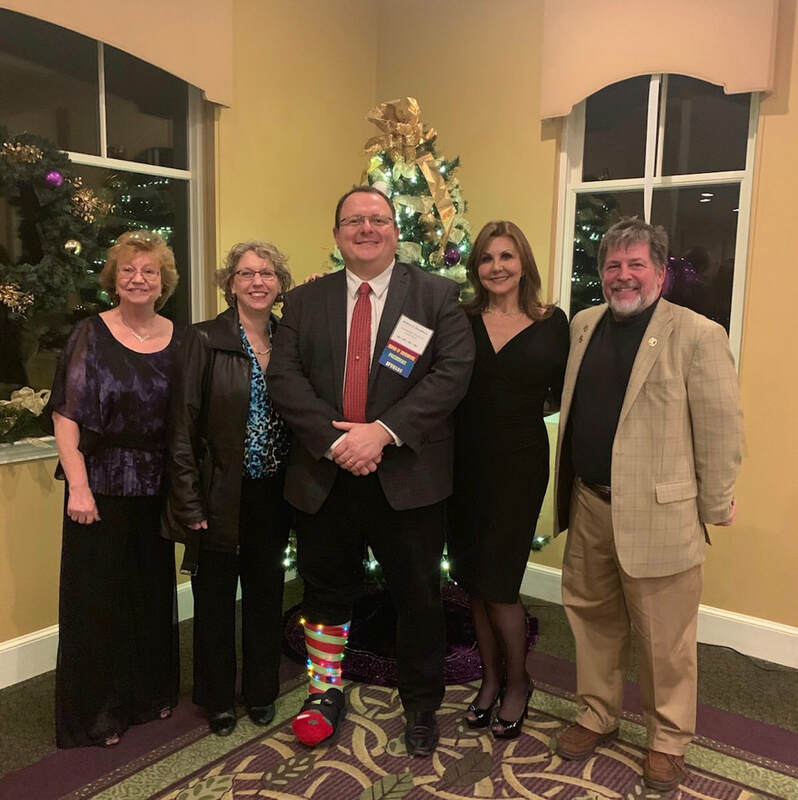 (December 6, 2018) The New Hampshire Association for Justice held their annual holiday event and auction at the Derryfield Country Club with all auction proceeds benefitting Friends of Forgotten Children. The bidding was fiercely competitive with many bids in the high hundreds and one live auction item going for $2,000! FOFC cannot thank NHAJ President, Bill Woodbury, his staff, the sponsors, the donors and, of course, the members for their graciousness and generosity. (November 2018) TJ Maxx delivered an early holiday gift to Friends of Forgotten Children: a truckload of toys and gifts plus a check in the amount of $10,000! FOFC is so grateful for community support such as this. The generosity of TJ Maxx managers and associates is beyond words. All items donated will be given to FOFC clients. The money will be used for client services and programming and much needed capital improvements. 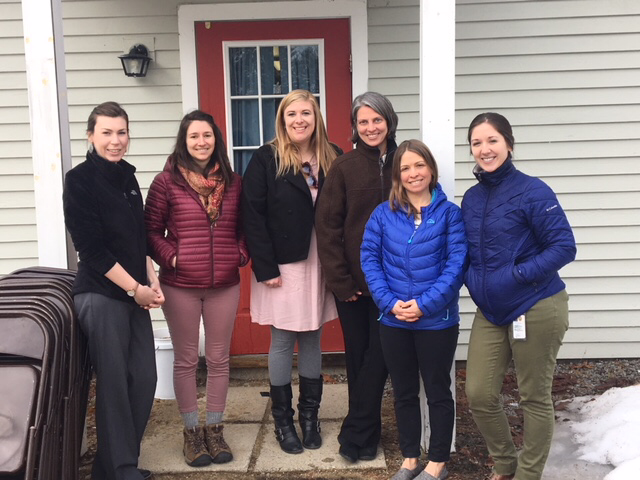 (February 2018) Friends of Forgotten Children received two shopping carts worth of feminine hygiene products collected and donated by NH Department of Environmental Services employees. Although we are primarily a food pantry, we offer our clients a wide array of goods including clothing, accessories, home goods, and hygiene products. We are so grateful to be able to have feminine hygiene products available for our female clientele. Thank you to Emily Jones, Amy Rousseau, Emily Nichols, Jacqueline Howarth, Kaitlin Murphy, and Kim Bourgouin! Over 60 boxes of donated warm weather clothing! (January 2018) The annual Warm Hearts, Warm Coats drive at Burlington Coat's Concord, NH location delivered big this cold winter season! Friends of Forgotten Children also received generous warm clothing donations from Stryker Orthopaedics of Manchester. 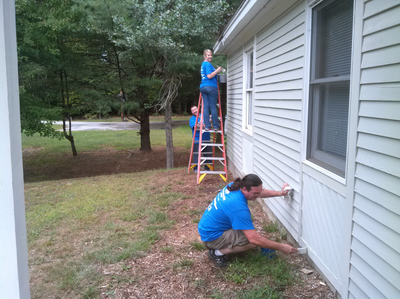 (October 19, 2017) Great companies treat their employees well and give back to their communities...and Unitil is one of those companies. 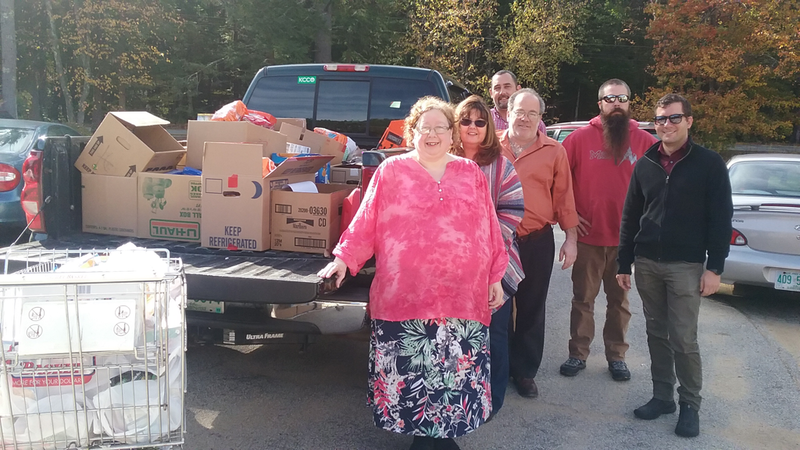 Unitil employees ran a food drive from September 18 through October 13 and donated a couple pickup truckloads of food to Friends of Forgotten Children’s pantry. Employees vied for raffle prizes and had a friendly competition to see who could donate the most. That’s a big win for all! (July 13, 2017) Summertime is a difficult time for many local families struggling with food insecurity. The kids are out of school and in need of the meals they normally receive from the school districts. This puts a strain, not just on the family purse strings, but on the pantries that service these families, as well. 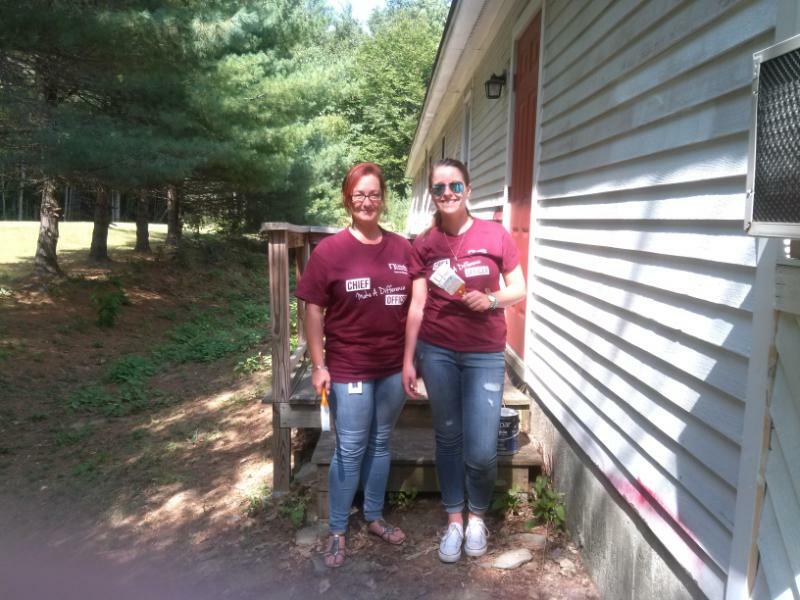 Thanks to what has become an annual tradition, Friends of Forgotten Children received a much needed summer food donation from the employees at the NH Department of Environmental Services. 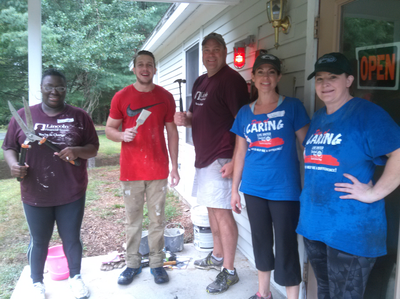 They collected over 1,000 pounds of food and nearly $800 which they delivered to our doorstep on July 13th! We welcome you to start a food drive in your neighborhood, office or social group. If you would like more information on what foods are most needed at this time of year, please checkout the Wish List on our website (www.fofc-nh.org/wish-list.html), send us an email (director@fofcnh.org), give us a call (603-753-4801) or stop by any Thursday for a tour (224 Bog Road). Have a few hours to spare? Volunteer! (June 28, 2017) What an amazing group of folks who showed up on Wednesday to help unload fresh produce donated by Sam's Club to Friends of Forgotten Children. Thank you to volunteers Jason, Matt, Judy, Cameron, Dustin, Meagan, Dotty, John, Gerry, Bob and Sherry! Do you have a few hours to spare each month? Looking for a group activity for your social club or church group? 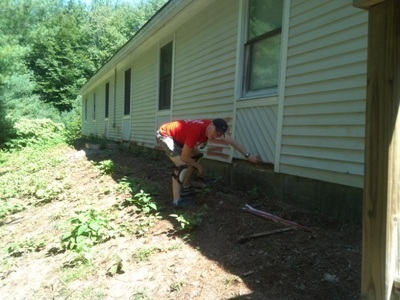 Need to complete community service? 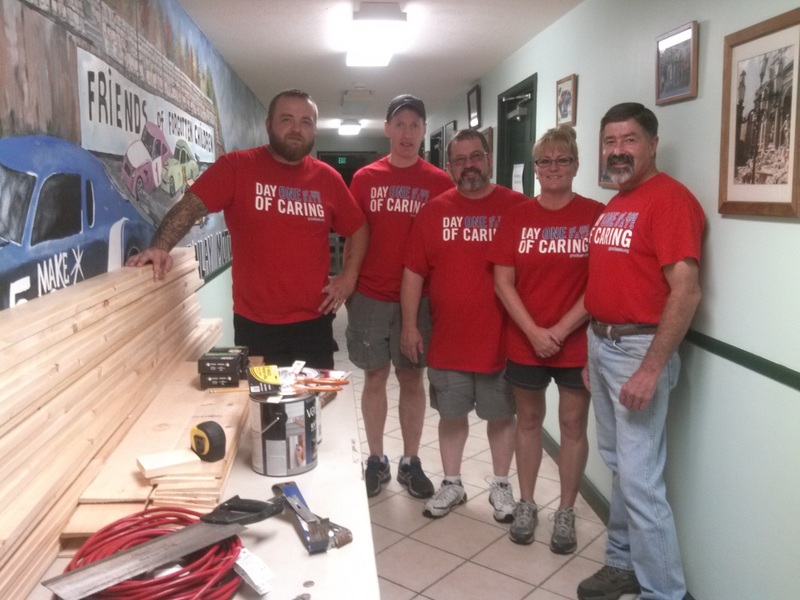 We are looking for volunteers to help with pantry, intake and clothing room duties, as well as special projects such as food bank pickup, loading and unloading and building beautification. 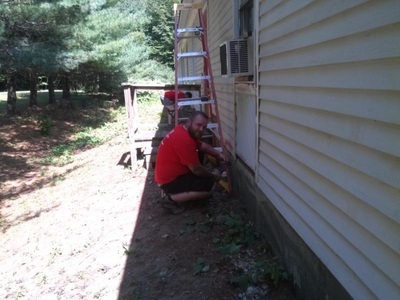 For more information on how you can lend a hand in your own backyard and help your neighbors in need, email volunteers@fofcnh.org, (603) 753-4801, or visit our Volunteer Page for a listing of available opportunities. Please visit us at 224 Bog Road, Concord, during our regular hours on Thursdays between 9:00am and 8:00pm. 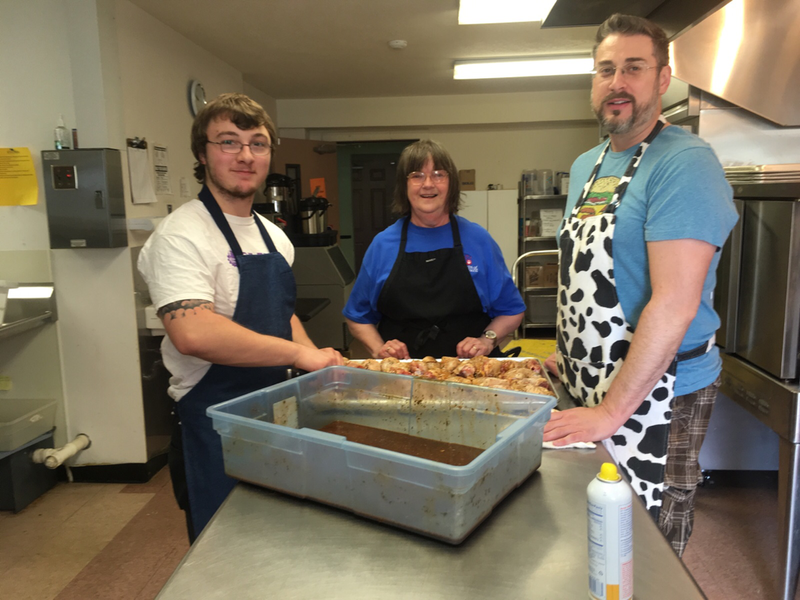 (June 7, 2017) Each Thursday between 11:30m and 1:00pm, Friends of Forgotten Children hosts a Community Meal. These complimentary meals are prepared by our volunteer chef in our on-site commercial kitchen. Lunch typically consists of soup, sandwich, soft drink, and dessert. Anyone in need of a midday meal is welcome to join us free of charge. Many of our clients depend upon the schools for breakfast and lunch. During the summer, we encourage them to bring the kids to the Community Meal. Some weeks we see a handful, other weeks we host a few dozen. Either way, all are welcome to sit, relax, and enjoy a healthy, homemade meal. 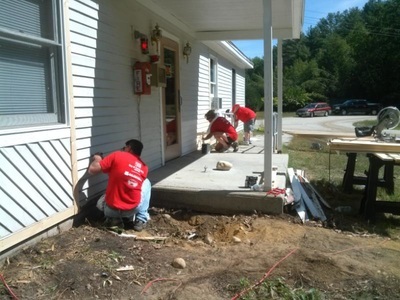 If you are available to volunteer to help, have a local company or civic group that can sponsor a month of meals or run a food drive for the weekly meals, or would like more information about FOFC, please stop by 224 Bog Road during our regular Thursday hours, call (603) 753-4801, email director@fofcnh.org, or visit our website fofcnh.org. 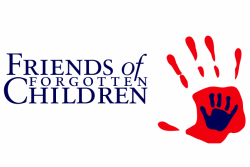 See the WMUR Spirit of Giving spotlight on Friends of Forgotten Children HERE. 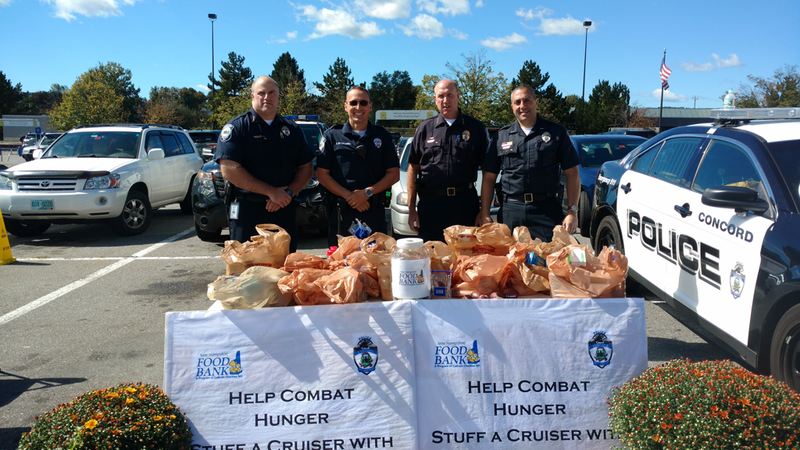 (September 24, 2016) Concord Police helped fight hunger in the community during September’s Hunger Action Month by partnering with the NH Food Bank to "Stuff A Cruiser." Three food drive events that brought in thousands of pounds of non-perishable food benefitted Friends of Forgotten Children, The Friendly Kitchen, and the Salvation Army. Together, we can solve hunger. (September 7, 2016) Volunteers came out to finish the beautification project at Friends of Forgotten Children's 224 Bog Road headquarters during the 2016 United Way Day of Caring. 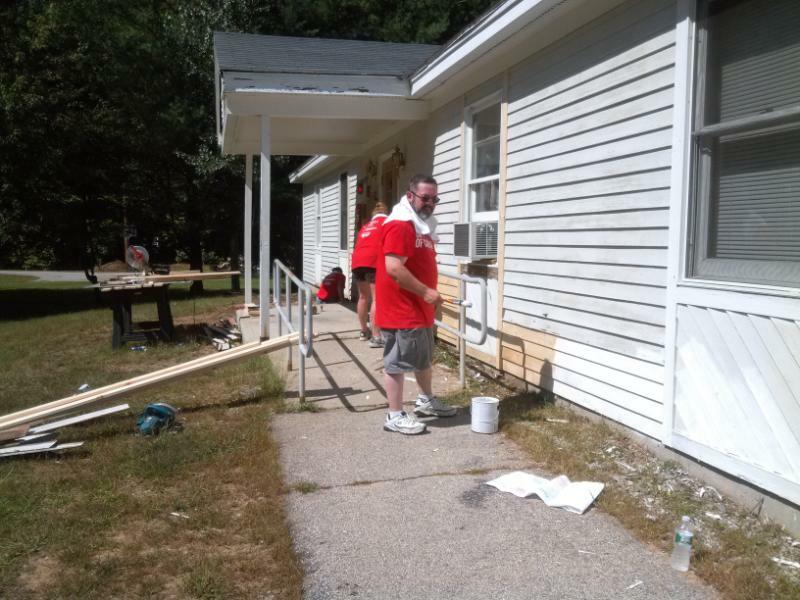 Big thanks to volunteers from Lincoln Financial, Merrimack County Savings Bank, and Franklin Savings Bank for giving back to your community during this wonderful event! 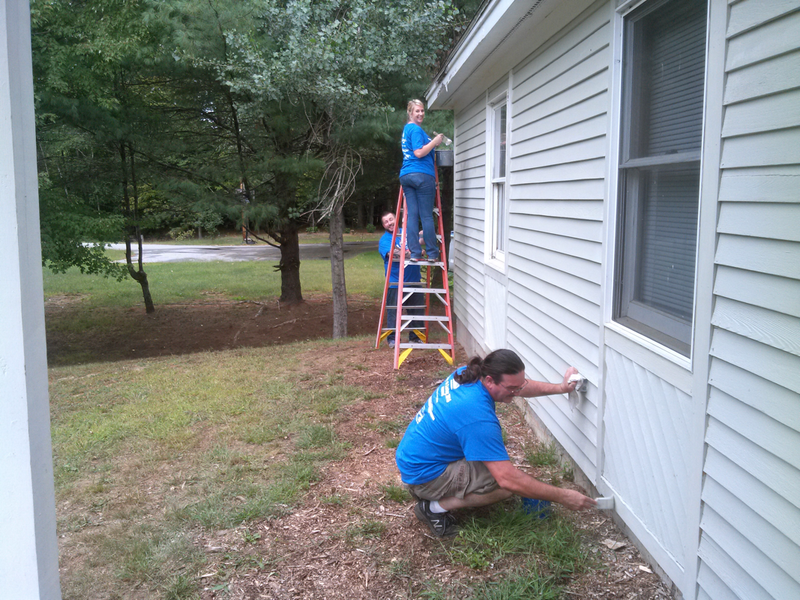 (September 9, 2015) Volunteers came out to help beautify Friends of Forgotten Children's 224 Bog Road headquarters during the 2015 United Way Day of Caring. 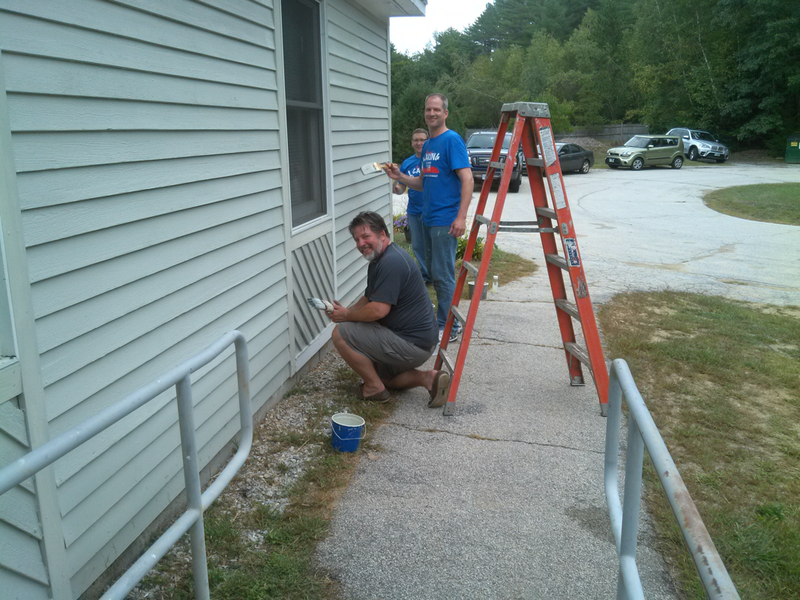 Rotted boards were replaced, landscaping was freshened up, and the building was pressure washed, primed and painted thanks to volunteers from Elektrisola and Lincoln Financial, as well as FOFC Board Member Tom Rochette. Thank you to Debra B., Matt, B., John D., Ashley G., Randy O. and Kevin T. from Elektrisola and Danielle B., Nicole B., Leigh-Anne K. and Desirae V. from Lincoln Financial for giving back to your community during this wonderful event! (March 27, 2015) Volunteers from Bow Mills United Methodist Church (UMC), came together to create beautiful and fun Easter baskets for 40 local children in need. The baskets included coloring books, pencils, bubbles, Peeps and, of course, candy! Basket donations were made by Bow Mills UMC, Friends of Forgotten Children board members, and Kevin and Marlene Shay. Any leftover candy was donated to SouperFest which was held at Rundlett Middle School on March 28, 2015 to benefit the Concord Coalition to End Homelessness. (November 5, 2014) The planning began in early spring, continued throughout the summer, and swung into full gear in autumn. The auction committee meetings, the constant emails and phone calls...was it all worth it? Yes, it most certainly was! Thanks to the large turnout that filled the hall at the Bektash Temple in Pembroke, The Capitol Region Board of Realtors raised over $10,000 to benefit Friends of Forgotten Children. The money raised will go towards both client services and the Friends Freezer Fund, which is raising money to purchase a walk-in freezer to replace the old, energy inefficient household and chest freezers currently in use. 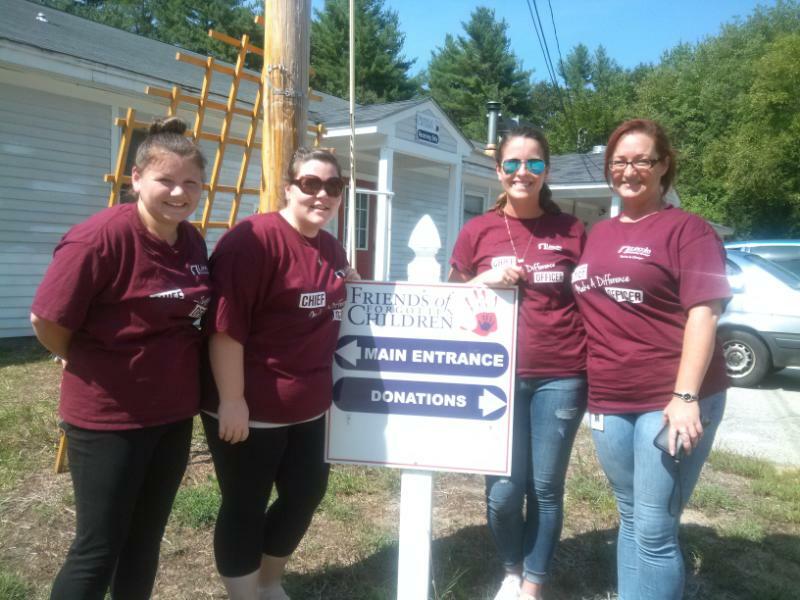 (April 4, 2014) Thirteen Couto Family-owned Dunkin Donut franchises located in Concord, Bow, Boscawen, Loudon, Chichester and Pembroke held a coin collection for Friends of Forgotten Children during the past month. 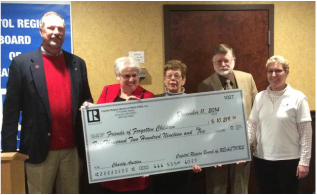 Over $5,200 was collected, including a generous donation from the Couto family themselves. The contributing franchises included: Aiden Donuts, Jayden Donuts, David Donuts, Capitol Donuts, Felicia Donuts, Azores Donuts, Pembroke Donuts, COCA Donuts, Chichester Donuts, Loudon Donuts, South Main Donuts and Bow Donuts. (January 19, 2014) Local musicians Darrell Cook and Blake Patria wanted to help local nonprofits by doing what they do best: playing music and having a good time. They are buskers or street musicians. You've probably seen them or their associates around downtown Concord with their guitar cases open. What happens if you take the music indoors and still have the guitar case open? You raise money for a cause, that's what. On Sunday, January 19th, Tandy's hosted Darrell and Blake's second Busking for a Cause event, this time to benefit Friends of Forgotten Children. Emceed by Rachel Vogelzang, we got to enjoy the eclectic sounds of Don Bartenstein, Mike Gallant, Delanie Pickering, Ross Boyd, Dillan Welch, Joe Messineo, Tristan Omand, Steve Chagnon, Lauren Hurley, Brad Myrick and Paolo Pianezza, as well as founders Cook and Patria. The festivities ran well into the evening and raised $400! Thank you to all the talented musicians who gave their time and all the patrons who came to support both the musicians and Friends. (January 13, 2014) Friends of Forgotten Children lost a truly great friend, supporter, volunteer, and all-around wonderful person when Amy McKay passed away on Sunday, January 12th. 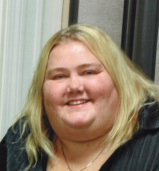 Amy helped run our Christmas Gift Wish Program and did client intake at FOFC over the past few years. She was terrific with the clients, listening to them, making sure their needs were met, and always with a smile on her face. Amy wanted to help the community so much, always asking what else she could do, even when her health wasn't 100%. The Christmas Wish Program was her pride and joy, always tweaking it, making suggestions to help it run smoother, reaching out into the community to find more supporters and people to adopt wishes. She was always willing to do more. She will be missed. (December 15, 2013) Under the direction of Bridget Edinger, Creative Dance Workshop put on an amazing holiday dance show at the Bow High School on a beautiful, snowy December afternoon. A few hundred people watched the dancers perform to ballet, tap, jazz and rap. This incredible group not only donated their ticket sales to Friends of Forgotten Children, but also collected warm coats and fulfilled nearly three dozen Christmas Gift Wishes for those in need this holiday season. A huge thank you goes out to Bridget, her staff, students and their supportive families to for giving a hand up to so many in the greater Concord community! (November 2, 2013) Over 300 pounds of food was delivered to Friends of Forgotten Children by student athletes, cheerleaders and parent volunteers on Saturday, November 2nd. The food was collected at Concord High School's last home football game against Goffstown on Friday night as part of the statewide New Hampshire Tackles Hunger campaign sponsored by WMUR-TV and the New Hampshire Food Bank, a program of the New Hampshire Catholic Charities and a certified affiliate of America's Second Harvest. In Concord, community members, boosters and students collected food to be distributed to three local charities: FOFC, The Friendly Kitchen and CenterPoint Church. Friends of Performing Arts (FOPA) collected and donated cash funds, as well. Thank you to all of these amazing supporters! (October 25, 2013) The White Mountain Chapter of the Nam Knights of America Motorcycle Club would like to thank the Concord Sam’s Club and its patrons for supporting our food drive on Oct. 11. Your support of the local veterans community and Friends of Forgotten Children is greatly appreciated and we cannot begin to thank you enough. It was our first food drive and it was a huge success. With the donated food and funds, we were able to fill the 8-foot bed of a Ford F350 with food twice. One truckload was given to the Friends of Forgotten Children in Concord. The other truckload was given to the Liberty House Veterans Shelter in Manchester. Nam Knights members include active and retired military and law enforcement personnel. The mission of the Nam Knights is to honor the memory of American veterans and police officers who have lost their lives in the line of duty; to assist veterans and police officers in their time of need; and to promote community awareness through sponsorship and participation in various community and fundraising events. (July 20, 2013) During the 2013 Concord Market Days Festival, new downtown retailer, Orange Leaf Frozen Yogurt of 70 North Main Street, chose Friends of Forgotten Children as their spotlight local charity. 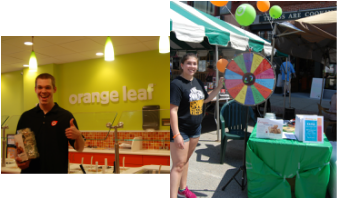 During the three-day festival, Orange Leaf's owner, Kristina Hathaway, General Manager Mitchel Power and their employees manned a Wheel of Chance. Customers who made a donation in any amount to FOFC were able to spin the wheel for a chance at free froyo, water, t-shirts, wristbands and more. 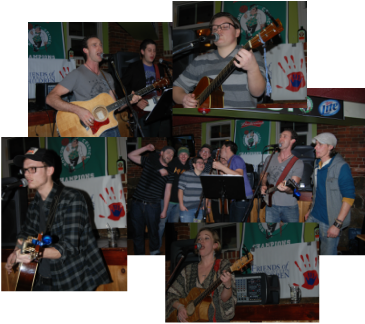 In all, nearly $400 was raised in support of Friends of Forgotten Children. Thanks Orange Leaf! 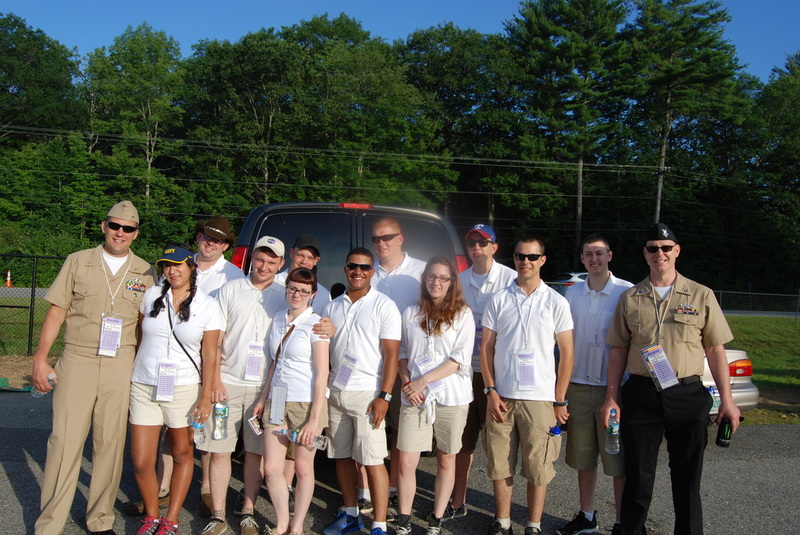 (July 14, 2013) About 30 sailors from the submarines USS New Hampshire (SSN 778), USS Miami (SSN 755) and USS Pasadena (SSN 752) volunteered at the NASCAR Sprint Cup's Camping World RV Sales 301 at New Hampshire Motor Speedway on July 14th. 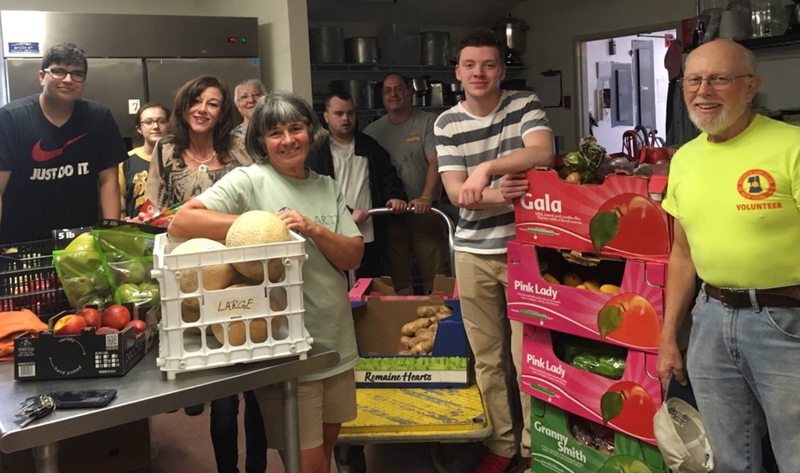 Their volunteer effort was to benefit Friends of Forgotten Children, a 100% volunteer-run provider of food, clothing, self-help classes and holiday gifts to low-income and at-risk families and individuals in the greater Concord area since 1972. "There was a lot of interest from the guys on the ship to do more charity work," said Sonar Technician Submarines 2nd Class Samuel Eygnor, assigned to USS New Hampshire, who coordinated his crew's participation. "The guys were really excited to not only be able to help raise money for a great cause but also to be able to attend the NASCAR race." 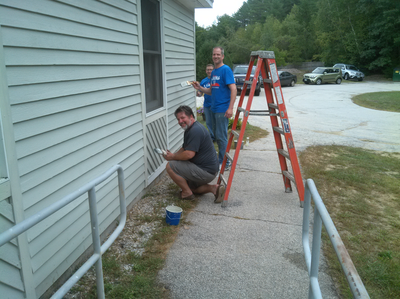 New Hampshire Motor Speedway donates to charities based on the number of volunteer hours worked. Sailors camped on the speedway's infield the night before so they would be able to start their volunteer shift at 5:30 am on race day. The crew members helped direct ticketholders to seats, screened bags and maintained crowd safety. "The fans that we interacted with at the race could not have been nicer or more supportive and everyone had a great time," said Eygnor. A special thank you also goes out to the Gilford Rotary Club who donated lunch to each of the sailors volunteering for Friends of Forgotten Children on this very hot Sunday. USS New Hampshire is a Virginia-class attack submarine based in Groton, Connecticut. USS Miami and USS Pasadena are Los Angeles-class attack submarines currently undergoing maintenance at Portsmouth Naval Shipyard in Kittery, Maine.